Our policy is to strive for the quickest shipment time possible. Orders are shipped on regular business days. Your satisfaction is very important to us. - Regular ground shipments: $7.95 flat rate shipping on all orders under $35. On orders over $35.00 within the United States and territories, shipping is free. There are no additional handling charges. We may use UPS, FedEx, and or USPS. Shipping terms apply only to the United States and its territories. Orders over $250. will require a signature upon delivery. - Overnight shipments via UPS will arrive the next business day excluding weekends and holidays, after departing Cappuccino Supreme. 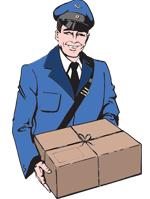 Please note: For next day shipments – on time delivery is guaranteed by UPS. Food items returned more than 10 business days after the order has been delivered will not be replaceable or deliverable. Shipping charges will be refunded only in the event that the wrong item was shipped or the item was defective. Sorry we cannot accept packages without postage/freight prepaid.